Dental implants offer patients a more natural feeling and functioning tooth replacement option. Unlike traditional treatments that only restore the visible parts of teeth, dental implants renew the entire dental structure: roots and crown. 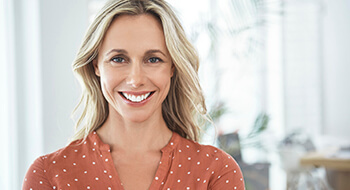 Littleton dentist, Susan Kutis, DDS is happy to offer patients from Ken Caryl and other nearby locations dental implant placement and restoration all in one comfortable, convenient practice. At Blue Sage Dental, we are dedicated to offering comprehensive restorative dentistry services to every patient, and dental implants are some of the most advanced treatments we provide. Contact our team to schedule a dental implant consultation today. Most patients are pleasantly surprised by how comfortable the surgical implant placement procedure and recovery period are. This first phase of treatment is remarkably simple. Dr. Kutis places a small incision in the gum line and places the dental implant post and attaches an abutment that will connect the implant to the restoration. While the surgical site heals and the implant fuses with the gum tissue and jawbone, a protective covering that promotes healing and tissue regrowth is placed over the top of the implant and abutment. This procedure is actually more comfortable and less likely to lead to complication than tooth extractions, and we use quality dental implant materials and placement techniques that have a success rate higher than 95%. Depending on the number and location of dental implant posts, patients may need to wait three to six months to have their permanent restoration placed. Single tooth – we place one dental implant post and connect a custom crafted dental crown to the top. In most cases, we're able to replace two consecutive teeth with a single implant post and two connected crowns. Several consecutive teeth – patients with three to four consecutive teeth may receive a fixed bridge, several connected prosthetic teeth anchored to a dental implant post on both ends. Several non-consecutive teeth – partial dentures are crafted to fill any number of gaps in patients’ smiles. The implant supported variety offer patients a complete smile without damaging remaining healthy dental structure to provide support. Full arch tooth replacement – implant supported dentures restore lost teeth while preserving jawbone density and gum tissue volume preventing changes to facial shape like wrinkles and sagging that often result from traditional dentures. We typically use four to six implant posts to support a full arch of teeth.